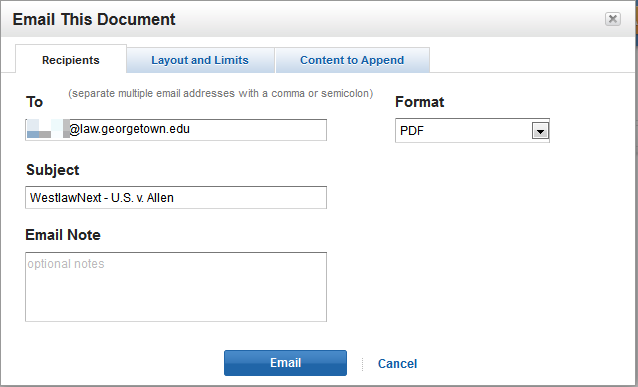 If you have a Kindle, you can send documents directly from WestlawNext to the device. However, in order for this to work you first have to authorize WestlawNext’s e-mail with Amazon, otherwise your Kindle will treat the e-mail as spam and reject the attachment. Here is how to perform that authorization and use the Send-to-Kindle feature (for users of the Kindle App on a non-Kindle device such as a tablet or smartphone, please also see the postscript below). At the top of this page is the e-mail address (or addresses if you have multiple Kindles or devices with the Kindle App) where you can send documents. At the bottom of this page is where you add approved e-mail addresses. It is generally advisable to add your own email address(es) so you can forward documents to your Kindle from your own account(s) as well. If you have a Kindle, add WestlawNext@westlawnext.com to this list. Having authorized the e-mail address(es), you send documents to a Kindle using the same menu you use to email, print, or download documents. Use the @kindle.com email address for your kindle that is displayed in the Send-to-Kindle E-mail Settings on the Personal Document Settings page discussed above. If you don’t have a Kindle device but you have a device with a Kindle App installed, you can still send documents but it requires a small workaround. 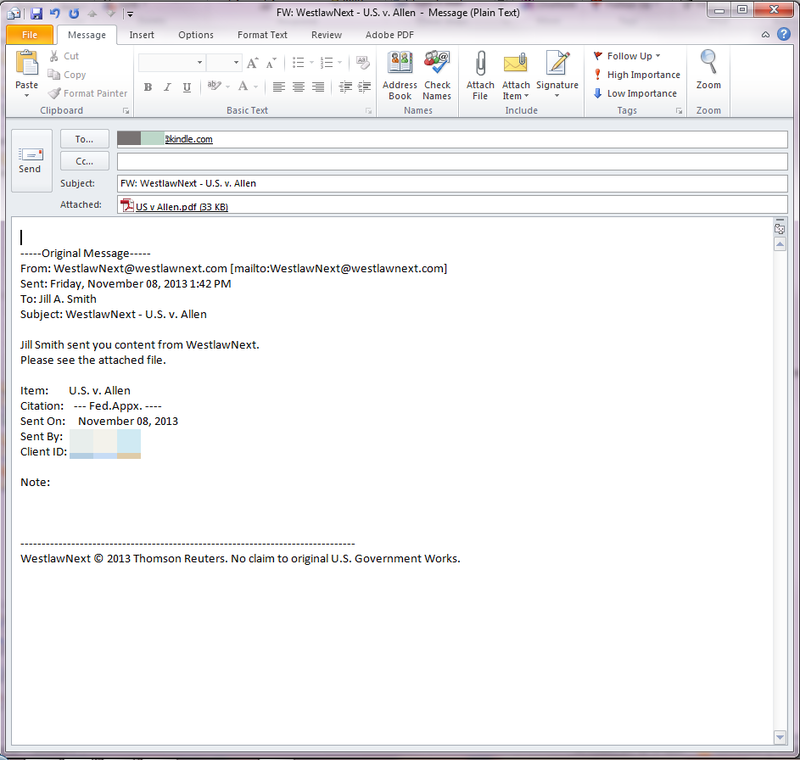 First use the e-mail feature in WestlawNext and send the PDF version of the document to yourself. 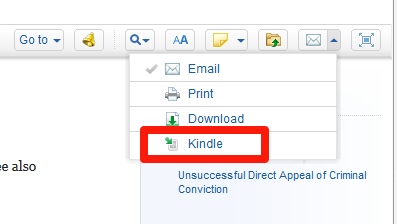 When the document arrives in your inbox, simply forward it to the device’s @kindle.com e-mail. (You will need to authorize your own e-mail address at Amazon per the main instructions above). WestlawNext@westlawnext.com to your device’s @kindle.com account. This entry was posted in How-To, Research, Technology News on November 8, 2013 by Jill Smith.